Quilt Taffy: It's A Winner! 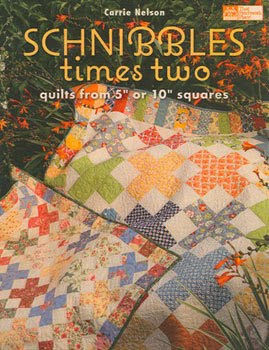 The contest was to make a quilt from the Schnibbles Times Two book from Miss Rosie's Quilt Co. using Moda fabrics. 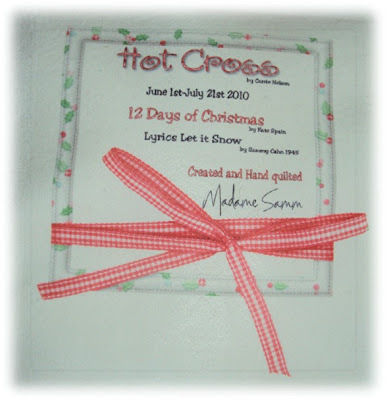 and 12 Days of Christmas fabric. 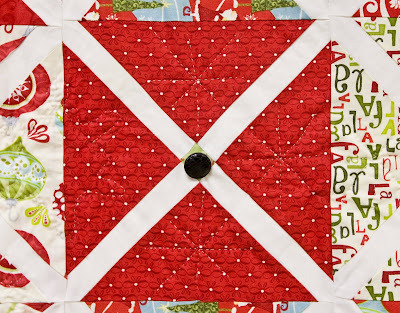 "As I began planning what I was going to do with this quilt, I thought of hot cross buns and they are soooo part of our Christmas, so I chose this pattern. Then I thought - to make it unique I would add the lyrics by Sammy Kahn of Let it Snow. I fused all of the lyrics right around the border, that was quite a task. But still it missed something. So I added self covered buttons. I used 7/8". I went with patent leather self covered buttons to look like the raisins on top of the hot cross buns. 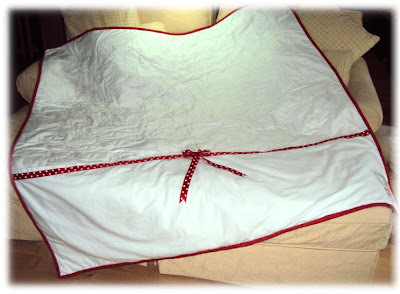 Since we live on top of Peninsula where the temperatures and winds get mighty cold, I thought this quilt will not keep me warm enough, so I thought why not a foot pocket, never saw one before, never even heard of it, but simply put, I wanted something to put my feet inso I did not have to fold the quilt and tuck my feet in it. A double brushed flannel pocket 69" across with little snaps inside to keep it closed when not in use, made perfect sense to me. I hand quilted snowflakes throughout the quilt using a cookie cutter as a template. 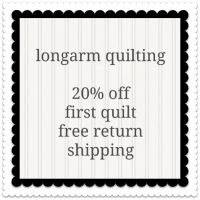 Quilting has so provided a needed outlet for me to mend. I stitched my heart back together on this project. This quilt will always hold something special. I really believed I brought warmth to life. And I am ready to show those around me, what love can do when you allow the whispers to carry you through." 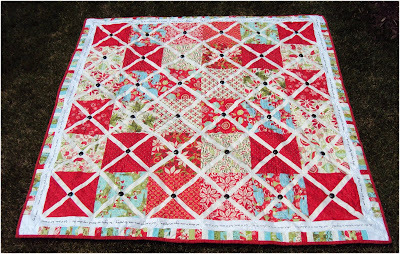 Samm's quilt was submitted by us to the That Patchwork Place/Moda contest. I think they're announcing the winners this week. Wow! I just love all the extra touches, way to go Samm!! Beautiful quilt! I love the bow on the back too! 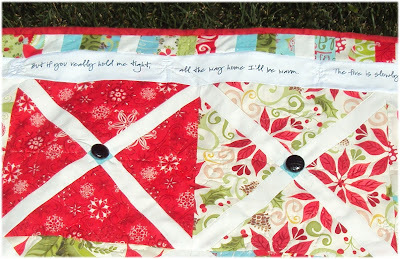 How fun to have a winner from Quilt Taffy... she got 2nd place!!! i love the foot pocket idea. i might have to try it myself.